Our Chapter is located in California. The Inland Empire Chapter covers Riverside and San Bernardino Counties. 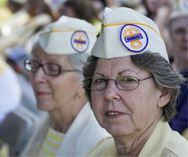 We meet approximately 6 times a year, which includes our Memorial Day and Veterans’ Day activities. Our Chapter has donated to several local JROTC, the young men and women are quite impressive and we are thrilled to support them. We participated in the Wreaths Across America for the first time last year and found it to be a wonderful opportunity for us to be a part of the wreath laying at the Riverside National Cemetery. Our National Cemetery is the most active National Cemetery in the System, with over 235,000 gravesites, and averaging 35 services a day. We take part of the Memorial Day and Veteran’s Day ceremonies and meet up afterwards for lunch at a local restaurant. Two of our members, Gladys Baie and Elda Diaz sit on the Board of Members for the Riverside National Cemetery Support Committee and last year placed over 250 flowers arrangements on the gravesites for families unable to come in person. We also volunteer at the Riverside National Cemetery assisting families arriving for their service by giving them an overview of what will take place during the service, and answering questions in regards to the honors presentation and burial information. We also assist the Cemetery Representatives and the Memorial Honor Detail Teams.